It was the best of times and it was the worst of times on the race course for Les Voiles de Saint-Tropez; where Day 3 saw stellar sailing conditions of fair winds and sunny skies, Day 4 saw gusts up to 30 knots, which convinced many captains to stay in port on what is traditionally the Challenge Day of the regatta. For the J Class, Velsheda took the lead today on Day 3 of racing, with her second win of the 4 contested. It was an exciting victory with Hanuman left behind the finish line only by two cables, at the end of a course of 20 miles carachterised by 14 knots of costant wind. 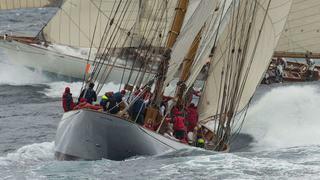 Day 3 saw the Wally Class racing twice again, with the first race offering moderate wind conditions from east-southeast. Open Season crossed the finish line first, followed by J One and Magic Carpet 3. While Day 4 is a lay day for most yachts, it is also a day where friends and friendly foes can challenge each other on the course. But the weather conditions proved perhaps most challenging. Today, going into Day 5, Boat International is live on the scene to race aboard the just-launched Tempus Fugit, and the weather looks similarly unpredictable. Stay tuned for a live action report.